The Customer Relationship Management (CRM) module is designed to track all relationships with guests to improve guest service and marketing. All guest visits are tracked from one or more RDP systems. Points can be awarded for each reservation. The number of points can be different for different seasons, room types, total dollars spent, and other variables. Guests can make reservations by redeeming points. Restrictions can be applied to control when "point reservations" are allowed. A complete history is kept of all point reservations. For a sample from Couples Resorst in Jamaica, see: http://couples.com/romance-rewards/login.php. Stimulate guest loyalty with Frequent Guest Rewards program. Master database for multiple RDP properties. Adding guests to the CRM database. Build an e-mail database in return for low-cost marketing. Information requests add to e-mail database. Guest Rewards "Flow of Events". Access by Frequent Guest Number or e-mail address. History of all reservations, charges, requests, and preferences. RDP Central Reservations if you are using more than one RDP system. A frequent guest rewards program is an excellent way to stimulate guest loyalty. Each time a guest stays at any RDP property linked by the Customer Relationship Management module, their points total is increased. Since a guest can make a reservation using points as a method of payment, there is a strong incentive to continue to stay at one of your properties. The Customer Relationship Management module is ideal for RDP customers with multiple properties. Please see RDP Central Reservations. To illustrate, assume a RDP customer has six properties, all using the RDP system. Without the CRM module, this customer would have six separate guest history databases. If a given guest were to stay at all six properties, this guest would have six different guest history numbers, with no way to easily consolidate the information. See RDP Central Reservations if you are using more than one RDP system. If the CRM module is added to an existing RDP system, an "auto-load" option is provided to load guests from the existing RDP guest history system into the new CRM database. For RDP customers with multiple systems, the "auto-load" option can merge data from multiple, existing RDP guest history systems. Screening of duplicates is available by guest name, telephone numbers, and zip code. All reservations from all existing RDP systems are linked to the new CRM database. Points can be accumulated based on auto-loaded reservations. The CRM module can be integrated to your primary website and the Internet Reservation Module (IRM) to capture information requests and add to your e-mail database. For example, you can add a link to "request a brochure" to your primary website or RDP's IRM. See Information Requests below. An option can be added to your primary website or the IRM for a guest to join your Frequent Guest program. The guest is immediately added to the CRM database, and a Frequent Guest Number and password is established. The guest can then make a reservation immediately at any property and start accumulating points. New reservations made by guests directly with the IRM or by internal reservationists with RDP's new windows based software, RDPWin, can add the guest to the CRM database. Guests may call and request to be added to the Frequent Guest program or they may fill out a form. Any employee can add these guests to the database from any workstation. Ideally, guests should check on their points total, reservations, etc., using the Internet. However, if these guests call the property, any employee can look up this information for the guest. 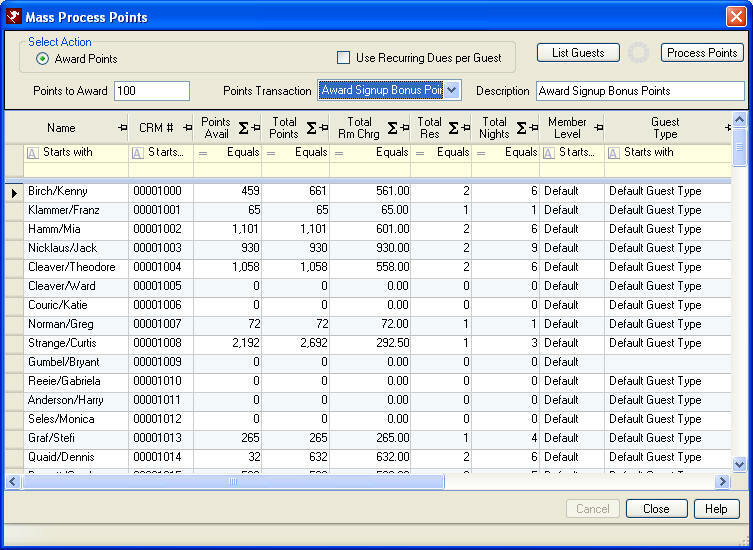 Guests' names can be imported from various third-party databases into RDP's CRM database. An additional charge may be required. The Customer Relationship Management module contains an e-mail address for each guest, along with a tool to easily send mass e-mails. E-Mail marketing is virtually free, as well as instantaneous. For example, an e-mail can be sent to all guests announcing an upcoming special rate. The guest could then click on a "make reservation now" link contained in the e-mail and be directed to the Internet Reservation Module for the property of his or her choice. The e-mail database conforms to legal requirements for mass e-mail, including an "opt-out" option, which allows any given guest to request that no further e-mails be sent. The Customer Relationship Management module can be integrated to your primary website and the IRM to capture information requests and add to your e-mail database. For example, a link to "request a brochure" can be added to your primary website or RDP's IRM.Net. The e-mail address is collected as part of the process to allow for future marketing. Purchase and install the CRM module from RDP. For multiple property installations, a license must be purchased for each property. The new CRM database is created on the server at only one of the properties. 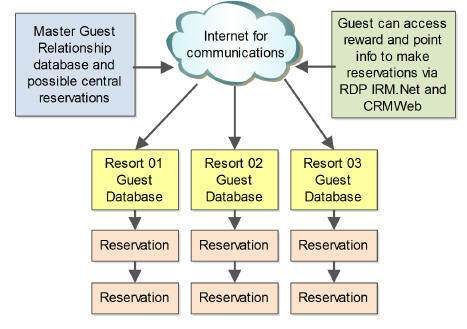 For multiple properties, a full-time Internet connection must be in place for each property to allow access to the new central guest history database. Guests are added to the central guest history database (see Adding Guests to the CRM Database). Guests make reservations for any property, either via the IRM or by internal reservationists, with RDP's new Windows based software RDPWin. All reservations at any property are linked to the same Frequent Guest Number. Points are awarded for each reservation, and various reports are available. Guests can access their Frequent Guest account via the Internet using either their Frequent Guest Number or e-mail address. A unique password for each guest can be used. Since most guests tend to forget passwords, the guest's zip code or phone number can also be used as a password. The system can also automatically e-mail a guest's password at the guest's request. The Customer Relationship Management module provides a history of all reservations, charges, requests, guest preferences and additional information. This is accessible to the guest via the Internet with the proper password. One way to increase repeat business is to manage the guest relationship, and a great tool to accomplish this goal is the CRM module. The Customer Relationship Management module can calculate points based on reservations made and other factors. The number of points can differ for different seasons, room types, total dollars spent, and other variables. Guests can make reservations that use "points" as a "method of payment." Restrictions can be applied to control when "point reservations" are allowed. A complete history is kept of all point reservations. Tracking points and providing rewards based on points is integral to a successful marketing campaign in today's tough market. The CRM module makes point tracking and rewards a breeze. Points can be awarded for a variety of reasons and are easily configured within the CRM Rules. A different point value can be awarded for anything from the date range of the guest's stay, to the rate plan used on the reservation, to the member level of the guest. These can be based on the dollar amount spent or number of nights. Points can also be awarded to all guests at once, based on their sign up date, or other specified criteria using the Mass Process Points feature. 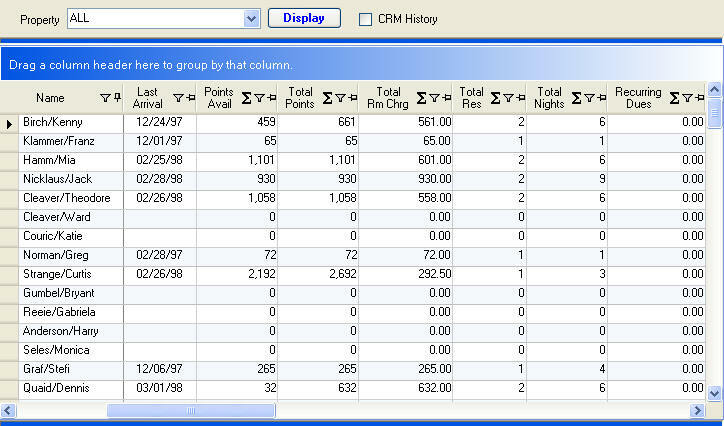 RDP's CRM module includes extensive "Data mining" capabilities. Data mining is the ability to find the information required from a large amount of data quickly and efficiently using many search criteria. For example, the ability to print letters or send e-mails to all guests who stayed at the property in the summer of 2004 and spent a least $500. Data is available from many RDP sources, including travel agents, groups, reservations, rates, occupancy, cutoffs, etc. For a sample from Couples Resort in Jamaica, see: http://couples.com/romancerewards/.